The detailed works in imagery contrasts the Segar forte which are very central in his philosophical style. In a collection of his works grouped together, the first impression given is that of a spiritually induced artist. Vividly stamping his signature for his individual identification, Segar has risen to heights of dominance in the art world, creating a new school art. His paintings need to be viewed in a manner to absorb the message hidden in his brush strokes. There is poetry and fables for the viewer to unravel and, he is no nature artist which makes it difficult to attract attention. The greens of the burgeons and blues of the skies are seldom found in his paintings, partly because his crowded figures tend to hide them. Segar, the name sounds romantic befitting the stature of a great artist. 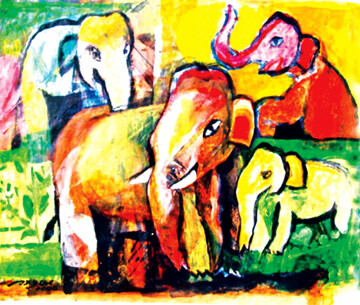 For someone whose central aptitude for figures is a mixture of aesthetic, cubicism, religious, contemporary and classicism has changed the face of the 20th century paintings in Sri Lanka, remaining within prolific post-impressionism but in no way influenced because he is the master of his own art. Sri Lanka is overflowing with talented painters from schools of art but they all remain within their own perspectives and seldom swayed by their influence so much so that their intensity is found in what they paint. This is a good sign for the future of our art and the youngsters who dream in becoming a Piccaso or for that matter, a Segar or a Senaka. The present generation of great artists in Sri Lanka leaves the base for continuation when it will not be long that greater names will emerge. 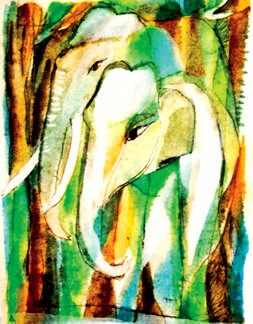 Forest elephants in mixed media 18x23 in 2008 by Segar. When masters such as Senaka Senanayake paints his passion is so great that it makes us proud that in the future, he will be named among Piccaso, Monet, Degas, Pissarro and Renoir though they are from different schools of art and I hope that some day Segar also will join the procession. It is a long and patient waiting but once the break comes, there will never be a shortage of Sri Lankan masters. Segar is unique in judgement of his subjects and the colour application is very bold, vivid and contrasting. He is unafraid of his colour blending and they all are mind set and pre-conceived. He can be accounted for a new and free impressionist school and are quite natural. He leaves theory for other painters while he splashes in lively sincere images which is one reason he has failed to cultivate nature painting. His art is sensitive and intelligent and the viewer has to have a contemporary pair of eyes to feast upon them with a psychological subtlety. Not that everyone can do it and swept off their feet. His illustrations took me to many exhibitions to understand and the painter behind Segar because I am still a naturalist with an eye for paintings which make me put him in line with Goya whose paintings I detest. I do not wish to compare Segar with Goya; but I do find similar artistic shades between them. Segar is influenced by Indian mythology and history. His women for most part are Indian but the unexpectedness of his designs can be attributed to the study of instantaneous happenings of which he is keen observer. To what extent he remains within his framework, no one can guess. His artistic doctrine is well preserved in memory the way ballet is preserved in repertory. I do not think he has ever painted a scientifically perfect picture or got close to doing so. If he has, I have never come across such a painting. The most potent force in the development of his art is the ability to confine himself to his own identity that has already created a sort of Segarism. From what school of art does he emerge? Your guess is as good as mine. There is a sense of religion in what he paints. I have come across Ganesha, Buddha and Christ done with reservation and honour. The ox is his favourite animal which brings to surface the love he has for cattle so synonmous to Hinduism. Art, he believed is what the viewer sees and in difference to what the critic sees and between the two, Segar triumphs.